For quality competitively priced plants, get in contact with VAN DER WEL LTD. Cappagh Nurseries & Garden Centre today. 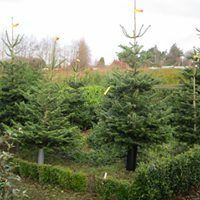 For quality competitively priced wholesale plants, get in contact with VAN DER WEL LTD. Cappagh Nurseries & Garden Centre today. (i.e. direct from the ground) during the dormant season (November - April). Types of plant material we supply, including many unusual/rare items. For quality competitively priced top quality plants, get in contact with VAN DER WEL LTD. Cappagh Nurseries & Garden Centre today. Hedging, Hedge row and screening plants. Bare -Root, Root Wrapped and container grown. Ornamental and Native, in a wide range of varieties and sizes. We have Bulbs, Seeds, Bedding and Vegetable Plants available when in season. Container grown where appropriate. Please call in and browse around our Garden Centre, or contact us about your requirements. We can advise on suitability and particulars of plants or goods we offer for sale and we will assist with packaging and loading of goods. For more information on any of our available items, get in contact with our offices today.